The Tristan da Cunha group contains three volcanic islands resting on the east slope of the mid-Atlantic ridge midway between South Africa and Brazil. Tristan Island, 111 km�, the youngest island in the group (1 million years), is still considered active with the most recent eruption occurring in 1961-62. Tristan consists of a 2060 m high conical volcanic peak with steep inclines that fall away to a more evenly inclined area of 600 m to 900 m in elevation. The coast is defined by sea cliffs up to 600 m in height, broken occasionally by low coastal strips. The rest of the islands are eroded volcanic cones which were once similar in size to Tristan Island. Nightingale Island is the oldest of these (18 million years), and most heavily eroded. The Tristan da Cunha group was discovered by Portugese Admiral Tristado d'Ancunha in 1506. One island and several rocks of ancient volcanic origin in the Atlantic Ocean. Highest elevation: 910 m (Edinburgh Peak). Probably sighted 1506, first landing 1675, sealers arrived 1804. Permanent occupation (scientific station) from 1955 (previously sealers wintered). British territory, part of the Dependencies of Saint Helena. 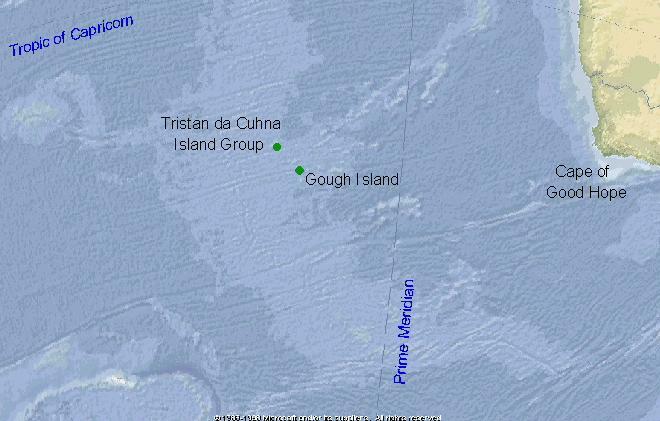 Gough Island, not fomally a member of the Tristan da Cunha Group, lies 425 km southeast of Tristan Island and is composed of volcanic lavas and ash. Gough's latest volcanic activity was about 2400 years ago. Gough rises over 910m and consists of a central plateau with several mountain peaks. The coastline consists of sea cliffs of 300m to 450m in height with narrow boulder beaches and no sheltered harbor. The southern end of Gough is the only area below 300m. Gough Island was discovered in the early 16th century by the Portuguese navigator, Goncalo Alvarez. Little was heard of the island subsequently, until it was resighted by Captain Gough of the Richmond, a British ship, in 1731. It became known to British and American sealers and whalers, who preferred the name Gough Island. Gough Tree Ferns Blechnum palmiforme) with Phylica arborea in the background. Restricted to open, sunny sites on cliffs and at penguin colonies. Fairly common in moist sites or under other plants. Uncommon in open, well-drained sites, including generating peat slips. Endemic. Restricted to coastal cliffs; abundant around penguin colonies and seal wallows. Fairly common in shaded sites, typically under rock overhangs. Common; only tree other than Sophora. Forms subclimax with tree-ferns in fern bush. Wet heath has procumbent forms. 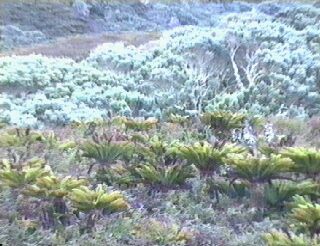 Some occur in tussock grassland and on offshore stacks. Common in fern bush, up to 2m high, froming sub-climax with Phylica arborea; dwarf froms occur in wet heath. Accociated with fern brush communities. Abundant in disturbed sites, including peat slips, stream banks, paths and around bird burrows. Planted by sealers, some persist at scattered sites along the east coast. Plants at the Meteorological Station at Transvaal Bay are probably from tubers introduced recently. Abundant along the coast and at disturbed sites inland, especially along stream banks to 600m . Fairly common on the coast and around the Meteorological Station at Transvaal Bay, scarce inland. May hybridize with S. oleraceus.